Step1. 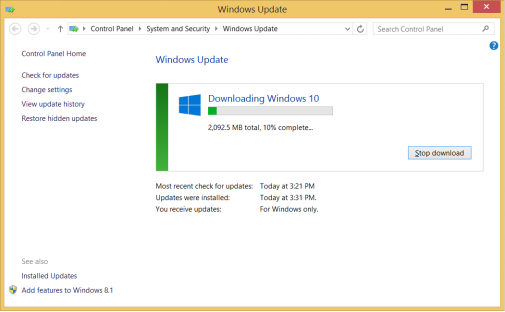 Install any available updates on your Windows8.1 to enable Get Windows 10 app. Go to Control Panel->System and Security->Check for updates to install Windows updates. 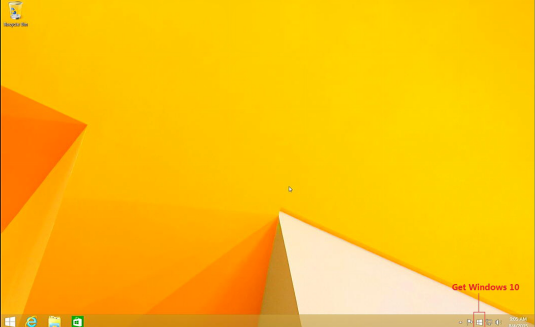 After all updates installed, “Get Windows 10 app” shows up automatically as a Windows icon in your system tray at the bottom right-hand side of your screen. Step2. 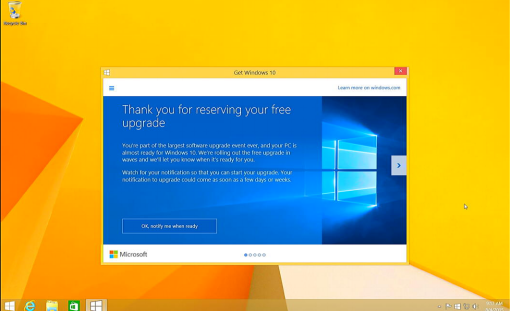 Click “Get Windows 10 app” to reserve your free upgrade. Step3. Click “Get Windows 10 app” and click View download progress to start download Windows 10. 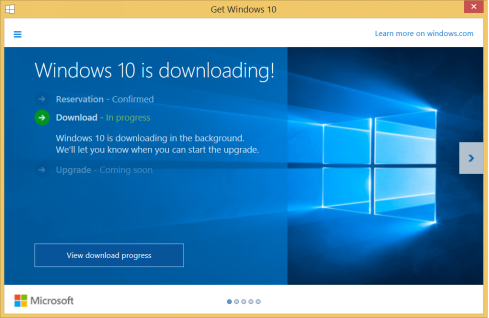 Click Get Started to download Windows 10. The update is over 2GB, so it may take 2 to 3 hours to complete the download. Step4. Upgrade to Windows 10. Click Start to upgrade now while your upgrade is ready to install. 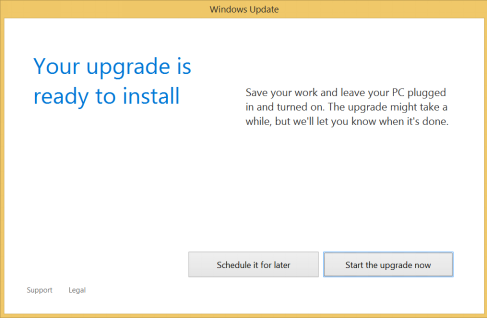 Or schedule a date and time when you want to install the upgrade. Keep power on during the whole upgrade. 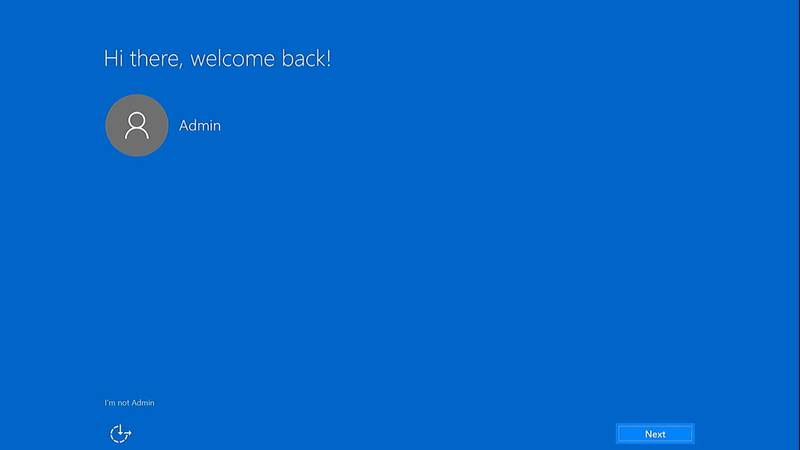 You will get the Windows 10 welcome after the upgrade finished. 2. 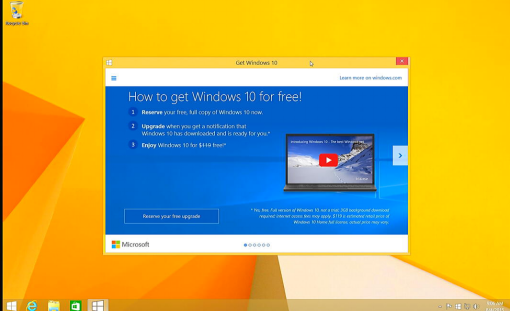 What is the Get Windows 10 app? 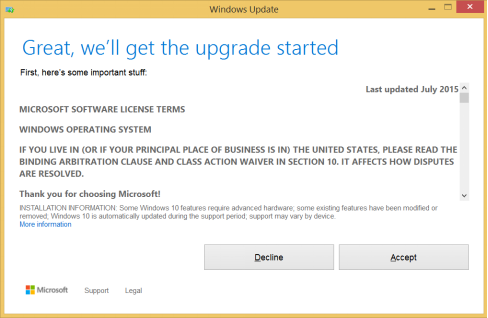 Get Windows 10 is an app designed to make the upgrade process easy. 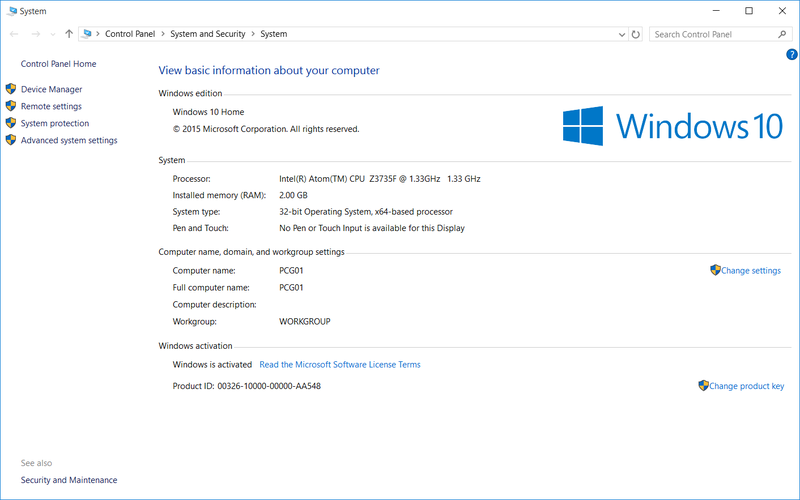 It checks to make sure your device is compatible, has information to help you learn about the features in Windows 10, and allows you to begin your free upgrade to Windows 10. For devices running Windows 8.1 Update with Windows Update enabled, the app shows up automatically as a Windows icon in your system tray at the bottom right-hand side of your screen. 3. Why don’t I have the Get Windows 10 app? Your device might be missing an update. Running Windows Update and installing any available updates could fix this issue. 4. When will I receive my notification to upgrade? You’ll receive your notification to upgrade once we can confirm your device is ready to upgrade. We look at the specific compatibility for your device and overall demand for Windows 10 when deciding if a device is ready to upgrade. After you reserve your free upgrade, your notification to upgrade could come as soon as a few days or weeks. 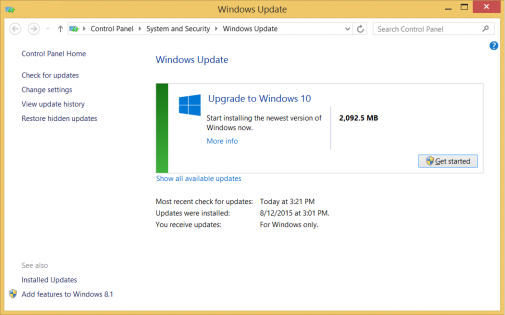 You also can Click Get Windows 10 app to check whether the upgrade is available. 5. What edition of Windows will I get after this free upgrade? 6. Can I go back to Windows 8.1? Yes, while we think you will love all the features of Windows 10, you will have one month after upgrading to revert back to the previous version of Windows on your device. 7. How do I go back to Windows 8.1? Make sure you haven’t make any change with Windows.old in C drive after free upgrade. Make sure you haven’t Reset this PC after free upgrade. Make sure you haven’t creat a new account after free upgrade. Step1. Press Windows key + I to enter into Settings. Step2. 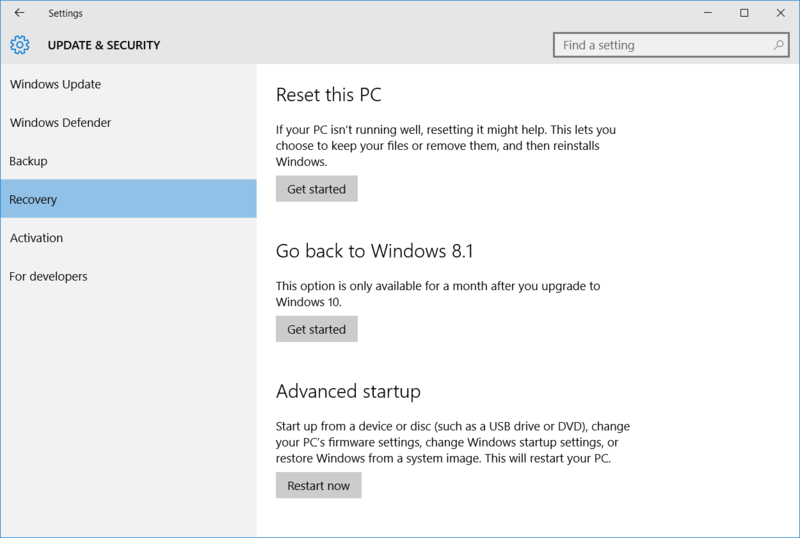 Click Update & Security -> Click Recovery, select Go back to Windows8.1 and click Get started to go back to Windows 8.1. 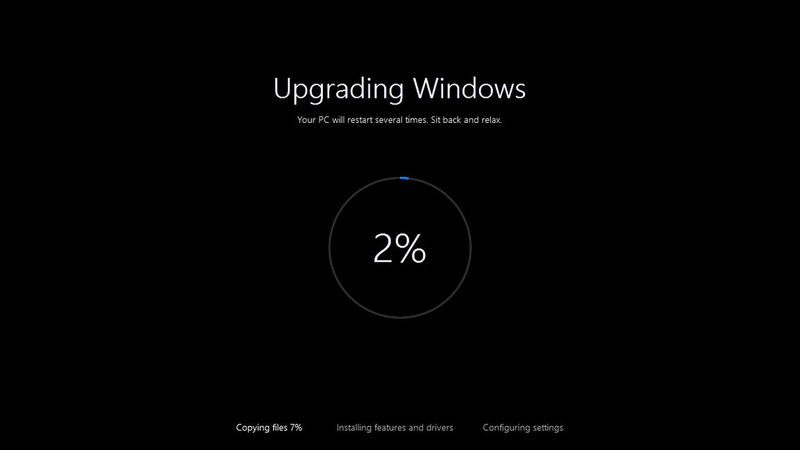 Method 2：Reinstall Windows 8.1 with USB flash disk. More questions,please refer to Windows 10 FAQ on Microsoft and Windows community. 下一页 : How to change User Accounts ?